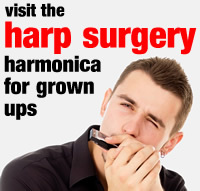 How to play harmonica with no hands! In Sweden a harmonica is called a Munspel. Here’s crazy Filip Jers from Sweden showing us how to play harmonica with no hands…and read the paper at the same time.